Got this for a friend who does roller derby. It holds up well on the track and looks great. Keeps time well and looks very snazzy. Recommended. A white sugar skull accents this stylish Nemesis timepiece. 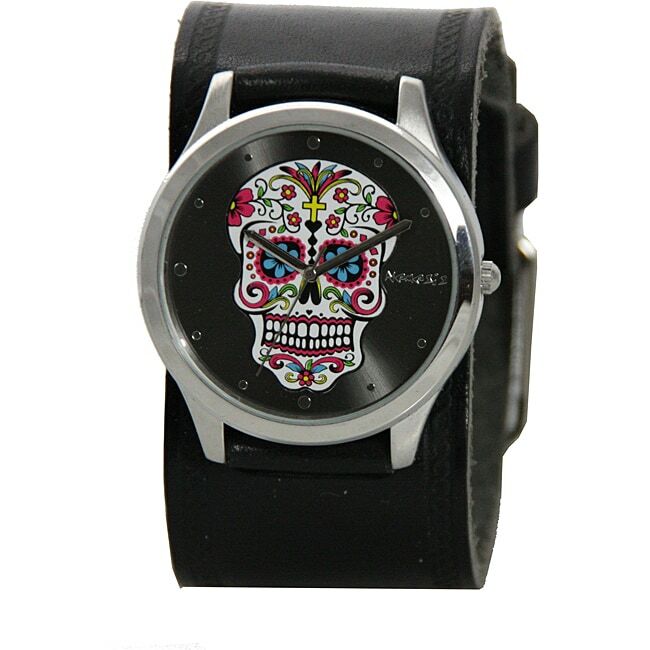 This unique watch features a black wide leather band and precise Japanese quartz movement. The watch is very big. I wanted a wide band but the watch case is very large. It's nice other than the size. I bought the brown with pink face a few months ago. I loved it so much I bought the black. They are a nice thick leather band, but on the big size. It will be loose around your wrist if you are of normal weight. Good quality leather , feels nice to wear I recomended this product. Sizing was a little off, but definitely a good purchase. I am very disappointed, I have had the watch for about a month, and it is already broken!